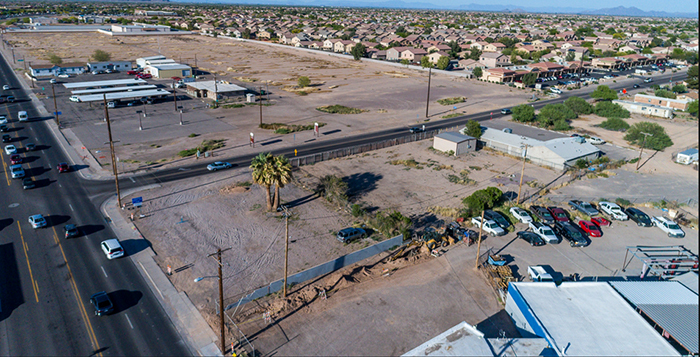 Maricopa photographer Jack Jackson took photos by drone for the Maricopa Historical Society to capture the appearance of the city around the State Route 347/Maricopa-Casa Grande Highway intersection before construction of the overpass. The photos include a topside view of the iconic water tower. The photos will be considered “historical” within a couple of years as the overpass transforms the appearance of that part of the city, and the Society wanted a photographic catalogue of the area. MHS President Paul Shirk presented the photos at an April 3 meeting of the Society at Maricopa Public Library. Arizona Department of Transportation will present an informational update about the project on Wednesday.